Here's some stuff I made in my spare time between collage classes during the past couple months....enjoy! All of them are made completely by me, unless otherwise marked. This is Gra'tua Runi.....she's new. SW is the official property of George Lucas...blah, blah, blah, same old junk, new edition.......however the characters are mine and I'd appriciate it if people wouln't use then in RPG's, fanfics, ect. without my permission. you can always contact me at jessmiller23@yahoo.com. Very nice job on coloring Kuk's inks. 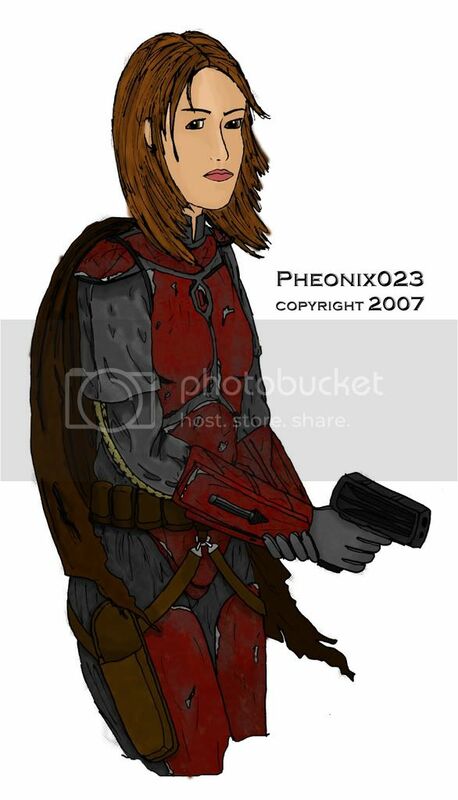 Maybe you've noticed, but he's a good buddy of mine and has drawn some nifty Mandos for me. That Mando on the swoop looks nifty, I especially like the idea of the throwing-stars bandoleers. 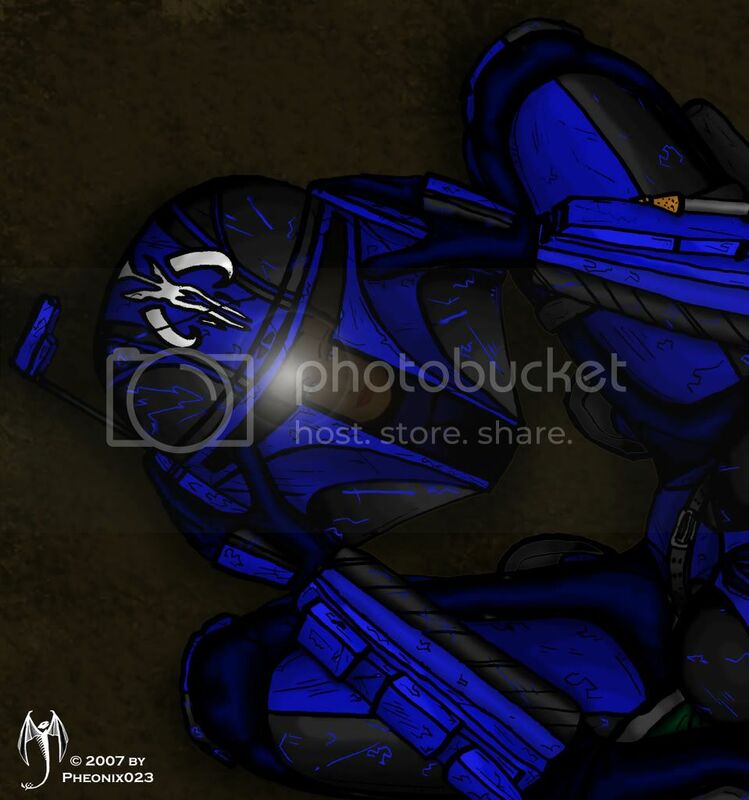 My favorite, however, is that blue Mando chick looking into her own helmet. It's a great idea, that has been done masterly! It's one of the best Mando arts I've seen, ever. 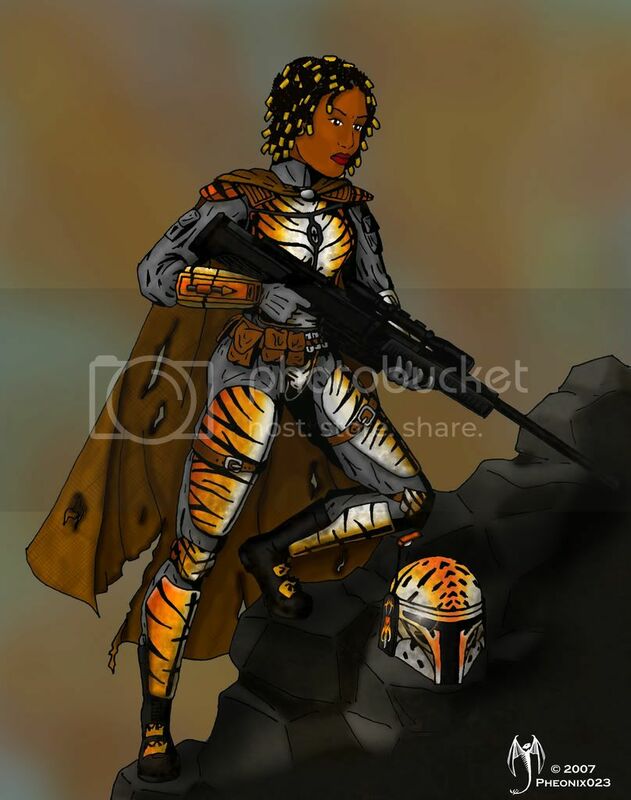 And I really like that last one, the "tiger" Mando, very cool armor design, her her pose is cool, too. Damn nifty job overall, you should head right to DeviantArt.Com and put your kandosii drawings up there - you won't be getting better feedback anywhere. Those are Alsome!!!!!!!!!!!!!! Hey could you make me one? His name has to be Karson Fett, Unless you don't want to. *Wishes he had simmaler drawing skillz* cool! Hey, thanks for the great feedback, especially so quickly! 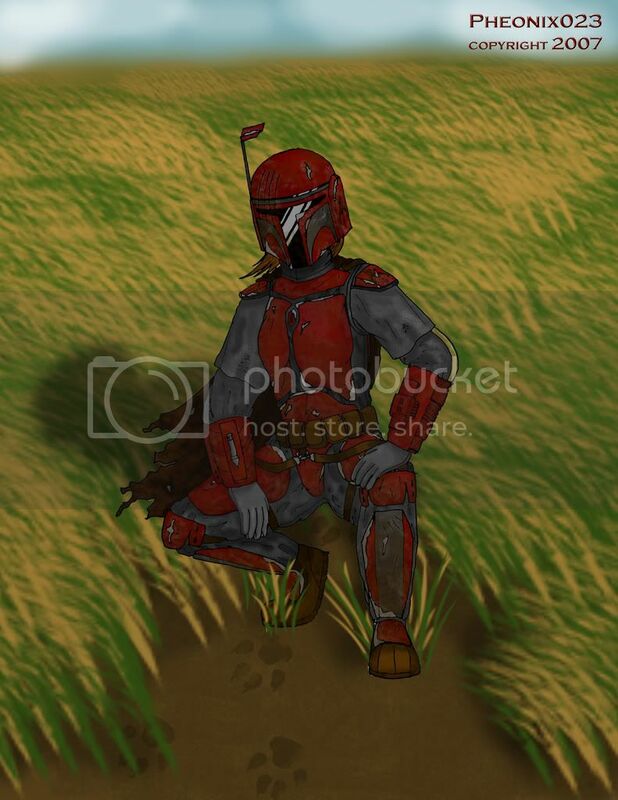 If you give me a description of armor(color, decals, ect)/gender/person(hair, eyes), yes, there is a very good possibility that "Karson Fett" would come to exist in pictureland. Yellow green and brown one color per piece plez of these. and the tiger armor is very unique...keep them coming. Oh, could you make the armor warn, dented scratched, color coming off. The art is great, you should do comics or somthing. HEy Karson, does your character have a kama? and when you say yellow/green and brown, do you just mean the plates, or are you refering to the jumpsuit? Is it a boy or a girl? One more, are there any decals, special stripes or anything? 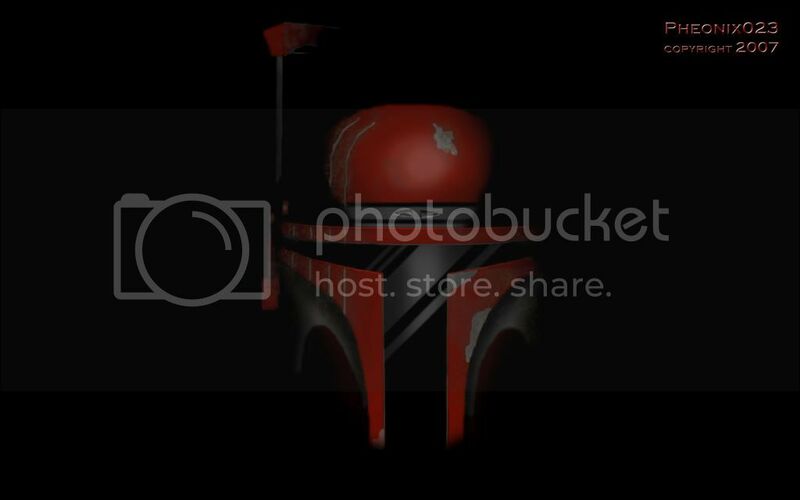 Armor, No effects, Male, jump suit is mocha color, A tarnished battle skirt would be good it should be green, the mando skull on a shoulder would be good; Thanks for doing this for me. E-mail it to me at karsonfett@gmail.com! yah very cool... but u should draw a guy atleast i mean come on us guys are cool enough to be drawn...no? Devin.....3 of them ARE guys....Fordo, the specialist, and Rimmer. he's the one on coruscant, lol. Unbelivable you have some amazing talent !!!!! Wow... Those are amazing. Generally speaking how long does it take to finish one? I could do one in a day or two if I'm doing nothing else....but since I have collage courses, it usually takes longer than that, more like somewhere between 3 days and a week. by animation, do you mean 3D? or just comic art? cuz I can do the comic art, but if you want 3D animation, I suggest you contact my brother at www.tornadominds.com, or his e-mail, www.tornadominds@gmail.com. 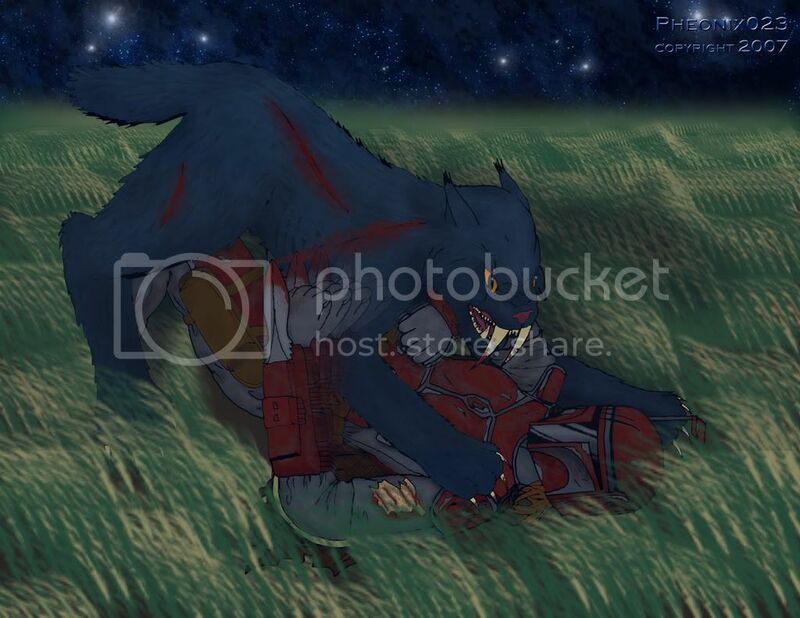 and one more thing, as a gereral rule,I don't send people the high res versions of my art. If you want to buy them thats great (they're 10"x 8", 300 dpi, great for blowing up to a bigger size, and I wouldn't charge a lot), I'll figure out how to do that when someone asks, only condition being you don't post it up or send it out to a bunch of people. But requesting for me to create pics is free, I do that a lot. and I color stuff for free too, once again, look at my dA page. and the pic is coming along great Karson, Its taking alittle longer than usual cuz he's killing a vong, and I had to look up some pics for reference, and I got my college stuff too. Soon as I finish the pencils for the vong I can start inking. Hey e-mail me when your done. I was kinda wondering if you could maby work on a Kal'ak one. I can get details to you later if you want to.